But he undermined his own contention that there actually exists a dire and urgent need for the extraordinary declaration. “I could do the wall over a much longer period of time,” Trump said during his free-wheeling speech. “I didn't need to do this.” That statement will be “plaintiffs’ Exhibit A,” constitutional scholar Elizabeth Goitein said in a tweet. He also repeated his contention that longer walls are necessary. "You don't have to be very smart to know you put up a barrier, the people come in, and that's it, they can't do anything unless they walk left or right and they find an area where there is no barrier and they come into the United States, welcome,” Trump said. Claims by Democrats — and his own U.S. Customs and Border Protection — that the majority of drugs that are caught being smuggled across the border are seized at ports of entry and not on unguarded frontiers are “lies,” he said. “It’s wrong, it’s wrong. It’s a lie. It’s all a lie,” he said. According to U.S. Customs and Border Protection statistics, 90 percent of heroin, 88 percent of cocaine, 87 percent of meth and 80 percent of fentanyl seized along the border in the first 11 months of 2018 was intercepted at legal crossing points. 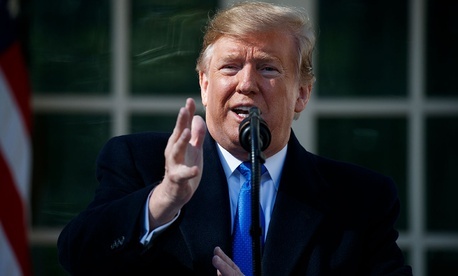 Trump appeared to suggest that he believed the perceived problem of drug smuggling into the United States could be resolved by more liberal use of the death penalty. "When I asked [Chinese president Xi Jinping], I said you have a drug problem? ‘No, no, no.’ I said you have 1.4 billion, what do you mean you have no drug problem? ‘No, we don't have a drug problem.’ I said why? ‘Death penalty. We give death penalty to people that sell drugs.’ End of problem." A 2016 report from Brookings Institution found that despite more than 500 laws regarding illegal drugs, these "’relentless and draconian countermeasures’ have been relatively ineffective China's drug problem. “Walls work, 100 percent,” Trump said. But there remains little evidence of any crisis the wall could solve. Illegal border crossings haven’t been as low since 1971; most illegal drugs are smuggled through ports of entry, not hauled across the open border; and there’s no evidence that undocumented immigrants commit more crime than native-born Americans. Meanwhile, the nation’s intelligence chiefs didn’t mention border crossings among the major threats to national security in their January congressional testimony. The declaration is expected to face a volley of immediate legal challenges, in particular based on claims that the president has invoked a state of emergency where none exists. There is no apparent precedent of any lawsuits challenging the factual basis of an emergency declaration, the New York Times has reported, leaving it an open question how the courts — typically loathe to substitute their thinking for the president’s on matters of national security — will handle such claims. A senior administration official on Friday morning declined to answer questions about the administration’s legal strategy. Acting chief of staff Mick Mulvaney said the declaration was justified because Congress is "simply incapable of providing the amount of money necessary in the president’s eyes to address the current situation at the border." $1.375 billion from the budget deal agreed to by lawmakers this week. $600 million from the Treasury Forfeiture Fund. $2.5 billion in Pentagon counter-drug activities funds, including reprogramming money from other military accounts. $3.6 billion in military construction funds. Under the emergency authority, the White House can pull any funding from any unobligated military construction funds, Todd Harrison, a military budget analyst with the Center for Strategic and International Studies, said in an email this morning. Right now there is about $21 billion in unobligated military construction funds. On Friday, Trump says he asked “a couple generals” what they'd use this money for if Trump didn't use it for the wall. He said he can't say what they answered, but "didn't sound too important to me," the Toronto Star’s Daniel Dale reported.